It is the mission of the Charlotte County Jail, under the direct supervision of Chief Jailer Captain B.K. Lockridge, to provide appropriate supervision of persons incarcerated in the jail, to meet their basic human needs, and when possible, to make available programs which will promote a positive attitudinal and behavioral climate in the jail. The jail is adjacent to the Charlotte County Sheriff’s Office and houses approximately 65 inmates. Visitation days are Wednesday and Sunday from 8:00 am to 4:00 pm for both male and female offenders. Attorneys, probation officers, and parole officers are allowed to visit clients Monday thru Friday 8:00am to 4:00 pm. Attorney visits with inmates outside the scope of this schedule should contact Captain Lockridge at 434-542-5141. All clergy visits must be arranged through Captain Lockridge at 434-542-5141. All visitors to the jail are subject to search. No cell phones, recording mobile devices, smoking, food or drink are allowed in the jail. Attorney visits are confidential. Attorneys are only allowed to deliver legal material to inmates. The Control Room operator shall be made aware of any items to be given to the inmate and those items will be searched. Offender phone services are provided by PAYTEL. You may contact the provider by calling 1-800-729-8355 or on-line at www.paytel.com. On April 8, 2014 the Charlotte County Board of Supervisors passed a resolution commending Captain Keith Lockridge, Jail Administrator of the Charlotte County Jail, and his staff for their recent achievements and recognized them for their commitment, hard work, and professionalism. This past January the Charlotte County Jail received a compliance rating of 100% from the Virginia Department of Corrections’ (DOC) for their annual Life, Health, and Safety (LHS) unannounced inspection. Along with the LHS inspections of 2009, 2011, 2012 and the three year audits of 2010 and 2013 this is the Charlotte County Jails’ sixth consecutive 100% compliance rating from the Department of Corrections. In attendance for the recognition on behalf of the Sheriff’s Office were Captain Keith Lockridge, Lieutenant Melissa Tharpe, and Sergeant Timmy Dix. 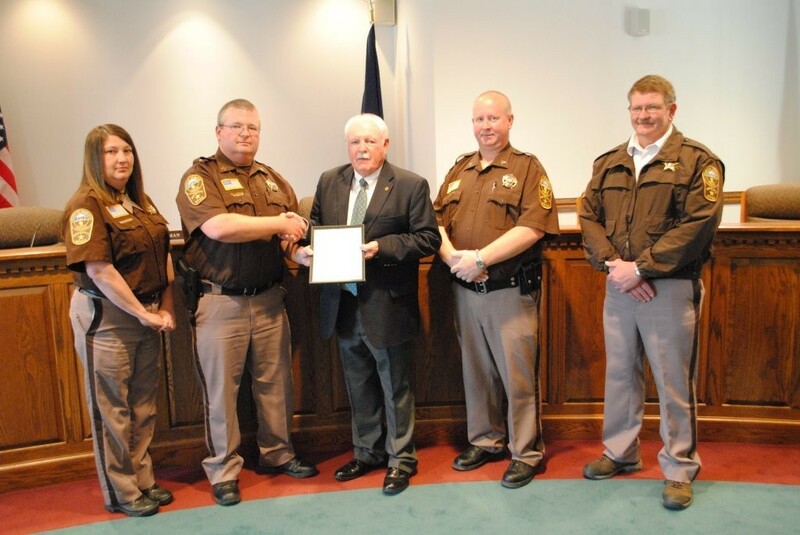 Lockridge would like to thank the Charlotte County Board of Supervisors and a special thanks to Sheriff Thomas D. Jones for the recognition and the support that is shown to the jail. Sheriff Thomas D. Jones wishes to recognize Captain Keith Lockridge for successfully completing the 71st Executive Leadership Institute conducted by the FBI-LEEDA (Law Enforcement Executive Development Association) from August 31 to September 3, 2015. “FBI-LEEDA is the premier provider of law enforcement executive leadership training nationwide”, as referred to by FBI-LEEDA President Greg Hamilton, with a mission of leadership and management training excellence. The Executive Institute is an intense, dynamic, and challenging five day program specifically and uniquely designed for law enforcement leaders in executive level positions. Lockridge has been a member of the Charlotte County Sheriff’s Office since 2005. He was promoted to Captain in May of 2009 and serves as the jail administrator.